Originally published in ‘Nature Territory’ October 2012, Newsletter of the Northern Territory Field Naturalists Club Inc.
Affectionately known as Scrubbies, these opportunistic, chicken-sized relics of Gondwana appear to thrive in close proximity to humans and often seem oblivious to our presence. They do especially well in our tropical gardens which offer many things that scrubfowl need, such as dense trees and vegetation and plenty of moisture. Gardens also provide a source of food such as insects, fruits, berries, seeds and shoots. Being a megapode, scrubfowl create nest mounds using plant material and sand or soil which pairs of birds will return to and maintain each year. Occasionally several pairs may use a single mound simultaneously (Palmer et al. 2000) and some mounds have had continual use for over 40 years (Jones et al. 1995). Using strong orange legs and feet the birds continuously add and remove leaf litter, mulch and other materials to the mound to mediate the temperature inside for egg-incubation. This is not always welcomed by gardeners since they dishevel garden beds and irrigation systems in the process. Not to mention that their ‘maniacal calls and screams carry some distance’ (Wildcare undated). Mounds are sometimes removed to deter messy, noisy birds however attitudes towards them are generally positive (Gillis & Noske 2007). Megapodius reinwardt hasn’t always been a suburban resident. It has a large range and is found in Indonesia, Papua New Guinea, Timor-Leste and northern Australia. It occurs in a range of habitats from sea-level to 1,800m, including lowland and montane forest, swamp forest, mangroves and more arid bushy or wooded country near the coast (BirdLife 2012). Local records suggest the birds used to be restricted to large patches of monsoon forest on the coast or inland (Crawford 1972) such as Casuarina Coastal Reserve or East Point and there is no mention of Orange-footed Scrubfowl in Thompson’s 1978 ‘Common Birds of the Darwin Suburbs’. Scrubfowl were first noticed inhabiting Darwin city around the end of the 1980’s and by the late 1990’s were a common sight in gardens and streets across 23 suburbs (Franklin & Baker 2005). So why this growth in the suburban population? Several theories exist. One suggests that two main threats to scrubfowl eggs, buffalo and monitors, have decreased significantly in recent years due to culling programs and cane toad poisoning respectively. Another theory points to destruction of scrubfowl habitat in places like Lee Point and Buffalo Creek to create the very suburbs the birds now inhabit. A third theory suggests that the suburbs initially acted as sinks for excess young from nearby rainforests and may now be both sinks and sources of new generations of the species. Whatever the reason, urbanisation of scrubfowl provides us with a great opportunity to learn more and some interesting behavior has been observed in recent weeks. 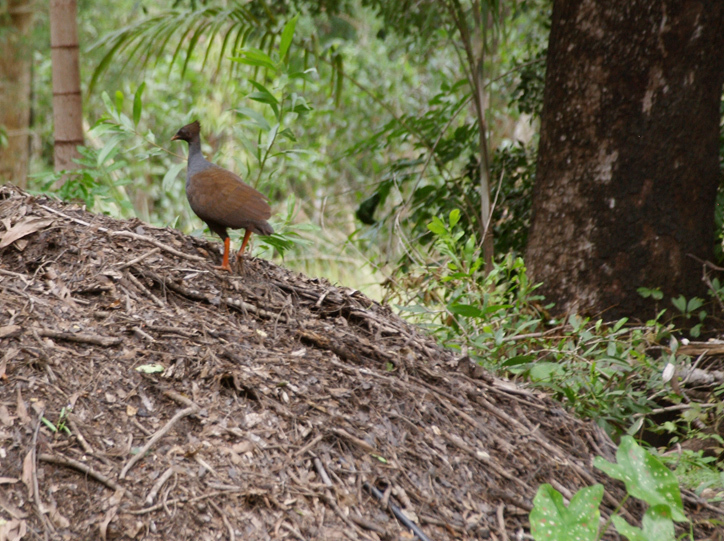 About four years ago on a Bees Creek bush block, a pair of Orange-footed Scrubfowl claimed for their mound a 2 metre tall pile of topsoil intended for the garden. They’ve maintained the mound and two juveniles have been spotted in the last two years. On Wednesday 18th July, the pair was challenged by a male previously observed foraging in open woodland to the rear of the property. The trio’s cacophonous shrieking, flapping and chasing around attracted the attention of another pair who appeared from nearby until all five of them were cackling and flapping about on the nest-mound. The neighbouring pair appeared to be helping the resident male defend his mate as they frequently lunged at the interloper and once they had seen him off, made a noisy exit back to their own patch. The resident pair returned to digging on their mound. A couple of hours later the challenging male returned and despite the female’s best efforts and her male’s attempts to divert the interloper, the latter managed to pin her down and mate with her. Immediately afterwards the resident male mated with her. This was followed by much chasing around the garden until finally the challenger left. A similarly extraordinary event involving five scrubfowl leaping on each other was observed the day before in a Darwin suburb. Perhaps the rain the previous Sunday had stirred the birds to begin breeding. Orange-footed Scrubfowl pair-bond but although the female is polygamous she tends to mate with other males out of sight and forced mating such as this is thought to be unusual. All of this begs several questions. Is it common for scrubfowl to interact this way or is this possibly a suburban behaviour? Has suburban breeding increased since the last survey was conducted in 1998? As clearing continues to cater for larger and denser human populations in Darwin, Palmerston and the rural area will the birds still find a home in our suburbs? There is clearly much more to learn about our Top End scrubfowl. Their high visibility, popularity and fascinating behavior could make these birds the ideal focus for a citizen science project. As well as adding to knowledge about the birds, participants might develop stronger attachments to their local Scrubbies and may inspire others to maintain wildlife friendly gardens and suburbs. This article developed from a discussion on the NT Birds list and the author gratefully acknowledges the following local birding experts for their contribution: Graham Brown, Fiona Douglas, Johnny Estbergs, Stephen Garnett, Mike Jarvis, Niven McCrie, Richard Noske, Magen Pettit, John Rawsthorne, Jo Wright. BirdLife International 2012. Species factsheet: Megapodius reinwardt. Downloaded from http://www.birdlife.org on 04/08/2012. Franklin, D.C. & Baker, B. The Orange-footed Scrubfowl Megapodius reinwardt as an urban bird in Darwin, Northern Territory. Australian Field Ornithology 22, 48 – 50. Gillis, M. & Noske, R.A. 2007. Orange-footed Scrubfowl in Darwin – horticultural pest or partner? Northern Territory Naturalist 19: 76-80. Jones, D.N., Dekker, R.W.R.J. & Roselaar, C.S. 1995. The Megapodes. Oxford University Press, Oxford. Thompson H.A.F. 1978. Common birds of the Darwin suburbs. Pp. 7-12. Wildcare undated. Living with Orange-footed Scrubfowl Factsheet. Downloaded from www.wildcarent.org.au/factsheets on 04/08/2012.